It is tempting to grant the title of the world’s most intriguing animal to one of the great apes. But a chimp has more in common with us than not; for want of a mere chromosome he might discard his bananas for a cubicle. Let us then examine a species a bit more difficult to anthropomorphize (but hardly impossible, given the glorious doe-eyed, impossibly aerial turn of Dumbo) but every bit as sentient, as self-aware, as the monkeys. The elephant is the largest land-dwelling beast on planet earth. The most massive specimen ever recorded was a massive 26,000+ lb. monster bull shot in Angola. The below list examines the lives and bizarre ends of some of the greatest beasts who have ever walked the earth. In 797 AD, Harun al-Rashid, the caliph of Baghdad, presented Charlemagne, King of the Franks and Emperor of the Romans, a clock that had a mechanical bird inside to pop out and chirp on the hour. He also gave him an Asian Elephant. While one has to assume that Charlemagne was enchanted with the cuckoo clock (this being well over a thousand years before one could pick up such delightful items at Pier One), the pachyderm obviously made quite an impression on him. As there is remarkably little dependable history on Charlemagne, so too are the history books relatively devoid of mention when it comes to Abul Abbas. We know for instance, that he was utilized in battle against the Danish. In 810, when he was in his forties, he died of pneumonia (Abul, not Charlemagne). This was likely exacerbated by one of his regular dips in the Rhine, and the understandable dearth of exotic animal veterinarians within shouting distance. On 13 April 1796 on the Private Armed Ship America, the second elephant to ever grace the Americas arrived. Oddly enough, the record of the elephant’s passage was kept in the logbook of one Nathaniel Hathorne (father of literary icon Nathaniel Hawthorne, who added the “w” later on). The elephant, named Old Bet, was on display across the eastern seaboard in the early 1800s. Somehow she came to be purchased by a farmer named Hachaliah Bailey (whose ancestral namesake would later be tacked on to the end of the most famous circus in the world, the renowned Ringling Bros. and Barnum & Bailey Circus) for use as a draught beast of burden. But he soon realized that he could make far more money displaying the elephant throughout the country than he ever could having her pull a plow around his farm. He established a traveling menagerie with Bet as the centerpiece. The admission for a family into this rudimentary show was a coin or a two gallon jug of rum. Bailey asserted that Old Bet was killed on 24 July 1816, while on tour near Alfred, Maine, by a farmer who deemed it sinful for the impoverished to fritter away their limited funds on such frivolous things as circuses. Paris, despite its culturally profound heritage, has seen horrific strife over the years, and the year 1870 brought one of the darkest periods in its history. German forces surrounded the capital of France, a blockade referred to as the Siege of Paris. With supply lines cut, the French turned to butchering whatever animals were at hand. Menus included such gourmet fare was Epaules et filets de Chien braises (dog in tomato sauce) and Civet de Chat aux Champignons (cat with mushrooms). The zoo animals were next. Enter Castor and Pollux, a pair of elephants. Named for the Gemini twins, they were done in with sum sum bullets and sold off to local butchers by the pound (with the trunks fetching a premium). Henry Du Pre Labouchere (a rich English politician and writer) sampled some of this fare, and had the following critique: “Yesterday, I had a slice of Pollux for dinner. 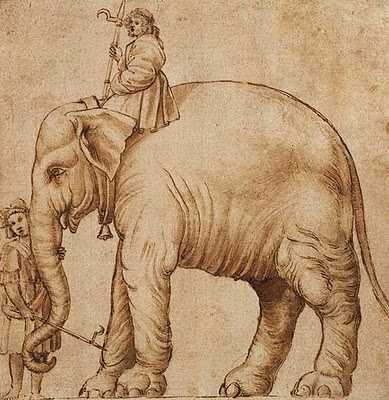 Pollux and his brother Castor are two elephants, which have been killed. It was tough, coarse, and oily and I do not recommend English families to eat elephant as long as they can get beef or mutton.”. Arguably the most famous elephant ever was Jumbo, a huge African bull captured in Ethiopia in 1869. He spent some years in England at the London Zoo giving rides, but was eventually sold in 1882 to showman P.T. Barnum for $10,000. Jumbo, whose name has become one of the foremost synonyms for “big”, got his name from a bastardized Swahili word; either jambo (which means “hello”) or jumbo (“chief”). He was indeed an exceptionally large specimen, probably at least twelve feet tall. On 15 September 1885, the circus was loading onto their train in St. Thomas, Ontario, Canada. Jumbo and a baby elephant named Tom Thumb were on their way to their car when an unscheduled freight train rolled into the station. 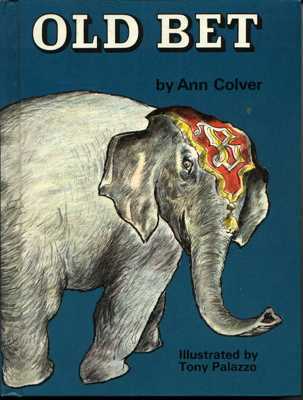 The little elephant caught a glancing blow that broke his leg; Jumbo got hit full on, his skull crushed. 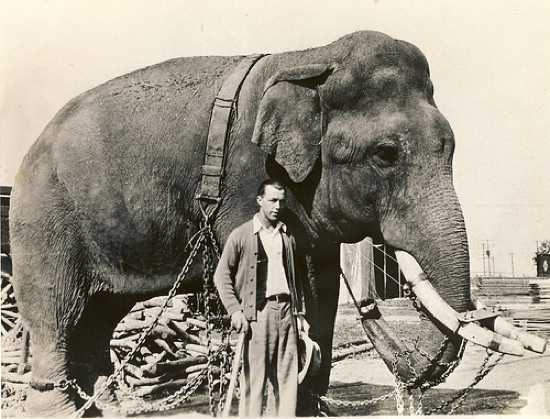 In his final moments, his trainer sunk down to his knees and cried like a baby, holding Jumbo’s trunk until he died. 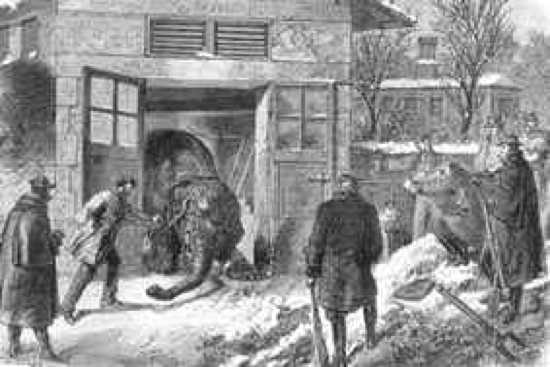 Jumbo’s stomach was found to be littered with English coins, keys, rivets, even a bobbie’s whistle. His skeleton was donated to New York’s Natural History Museum, and his heart was sold to Cornell University. Barnum had the hide stuffed and brought on tour for some years. In 1889, he finally parted with the last piece of Jumbo, donating his stuffed elephant to Tufts University, where he subsequently became the mascot. Any study of Brooklyn’s Coney Island must include the sad tale of Topsy, doomed to encounter the self-serving wrath of none other than the Wizard of Menlo Park, Thomas Edison. 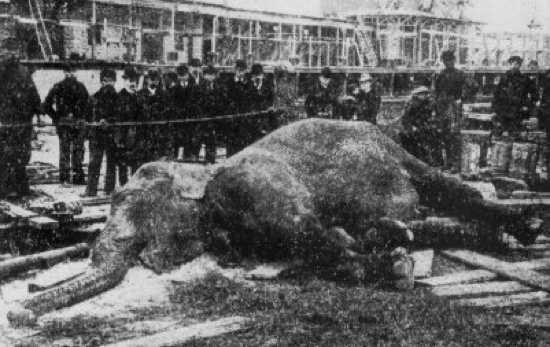 Topsy was an attraction at the Forepaugh Circus, and dealt rather permanent justice to at least three abusive trainers. The last made the mistake of trying to feed her a lit cigarette. Topsy was soon sentenced to die for her murderous ways. Enter Thomas Edison. The great inventor was in the fight of his life trying to prove that his model of direct current electricity was safer and more efficient than alternating current. Edison, being a shrewd if somewhat ruthless businessman, decided the best way to debunk AC technology was to electrocute defenseless animals with it. Surely if he could show the American public that alternating current was sufficient to zap such a tremendous beast, no reasonable man would risk the safety of his household using it. They pre-gamed Topsy’s execution by feeding her carrots laced with 460 grams (a little more than a solid pound) of potassium cyanide. Then they strapped on metal shoes and hit her with 6,600 volts of pure death. This spectacle was seen by around 1,500 people (apparently there wasn’t much to do back in the day) and was by all accounts, rather unspectacular. Topsy died within seconds. And while Edison would eventually lose the War of Currents, the incident was far from a failure for him. 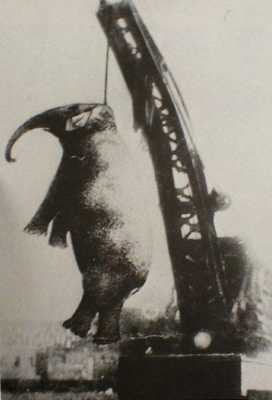 His film of Topsy’s demise, the rather obviously titled “Electrocuting an Elephant” was viewed in theaters throughout the world. Mary was a five ton Asian elephant who performed for the Sparks World Famous Show circus. She was accosted by a new assistant handler named Walter “Red” Eldridge in September 1916 in Kingsport, TN. 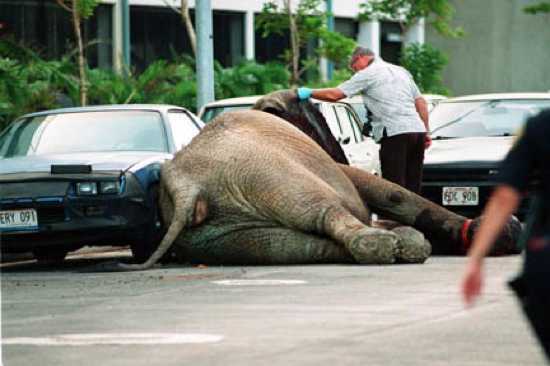 In response, she picked him up with her trunk, flung him into a snack stand, and crushed his head. Seeking justice, a local blacksmith decided to cap Mary, but unless you have a big gun and superb aim, shooting an elephant is a rather poor idea. Mary’s hide absorbed a couple dozen bullets with little effort; it was decided she would have to be hanged. A crowd of 2,500 had gathered, many of them children— to watch something that it would seem no human before or since would ever witness. A derrick chain was looped around her neck and a railcar-mounted industrial crane lifted her off her feet. But someone had forgotten to release the ankle chain which bound her to the track. For an awful moment she hung suspended in torment. Witnesses indicate the sound of her ankle tendons tearing was quite audible. The chain around her neck snapped, her hip shattering as she crashed to the ground. A subsequent attempt was more successful. Several grainy, sepia-toned photographs of Mary hanging pendulous in mid-air have survived the decades, and though a casual glance suggests Photoshop tomfoolery, they are quite real. 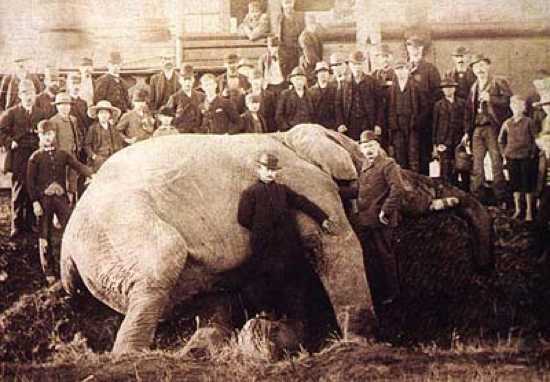 An enormous Indian elephant weighing some 18,000lbs., Black Diamond was owned by the Al G. Barnes Circus. He’d been a naughty boy in the past, so they kept him chained up to a couple of female elephants to calm him down when he was displayed in public. On 12 October 1929 in Corsicana, Texas, he went on another tear, injuring a former trainer and killing a woman. When his rage was finally quelled, the circus decided he was too dangerous to continue on with the show. They attempted to poison him, but the elephant was too shrewd for this ploy. Black Diamond was shot to death by Hans Nagel, the keeper of the Houston Zoo. He took at least 60 bullets before he fell. Pope Leo X (of the sordid Medici clan) received Hanno as a gift upon his coronation from King Manuel I of Portugal. The Pope loved his pet and often showed him off. 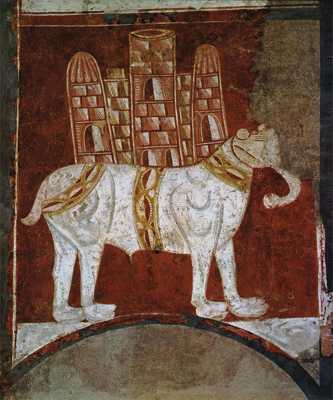 Like Abul Ammas, Hanno was a white elephant (actually a shade of pink), an animal considered sacred to this day by cultures in Southeast Asia. Two years later, Hanno became suddenly ill. Again owing the antiquated understanding of medicine in the day, he was fed a laxative tempered with gold and died on June 8th 1516 with the heartbroken Pope beside him. By 1994, the technological media available to capture such events as elephant rampages for posterity had improved greatly. Indeed, several camcorders were on site for the August 20th Hawthorn Circus in Honolulu Hawaii’s Neal S. Blaisdell Center. During the show, a 20 year-old lady named Tyke, who’d shown a marked propensity for naughty behavior in the past, had her last temper tantrum. Before hundreds of terrified witnesses, she killed her trainer Allen Campbell and gored groom Dallas Beckwith before escaping onto city streets. In their horror, the crowd dispersed rather spontaneously, resulting in several minor injuries. Unfettered by chains, wearing a garish red headdress, Tyke stormed down the streets. A gentleman named Steve Hirano, the event’s publicist, tried valiantly to curtail the mutiny, attempting to gate her into a parking lot. But a chain link barrier is little more than a casual suggestion to a furious elephant. Steve’s life was spared by quick thinking police, who fired into the air, scaring her off. Cops shadowed Tyke, emptying their service pistols into her hide. Over eighty bullets later, Tyke finally surrendered. She lay down in the street and perished of massive nerve damage and hemorrhaging of the brain. It is more than likely you have seen some of the footage from that fateful day, a sanitized clip on When Animals Attack! or its poorly budgeted shockumentary ilk.